COME WATCH THE BIGGEST GAME ON THE BIGGEST SCREEN IN DOWNTOWN FRANKLIN! Join us for a fun filled evening of football and festivities. Admission is FREE and seating is General Admission... arrive early to pick your favorite seats! Doors open at 4:30 pm and game time is scheduled for 5:30 pm. 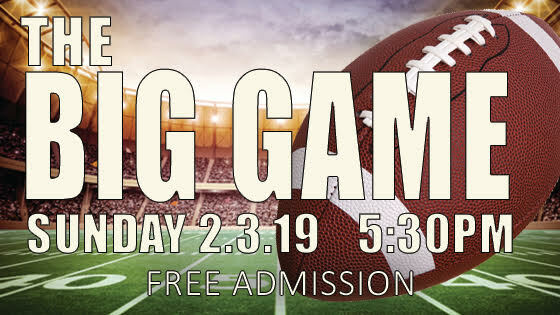 We'll have games in the lobby with a chance to win prizes and our concession stand will be open serving popcorn, sodas, candy, pizza, beer and wine. We kindly ask that you do not bring any outside food or drink into the theatre. Please, do not secure tickets unless you are sure all parties will be attending to eliminate the chance of unused seats and as a courtesy to others. This event typically sells out.